Over the past several years I have posted on New Year’s morning or thereabouts, sharing my goals for the upcoming year. They started out pretty vague back in 2009 and 2010, then became very specific in 2011 and 2012. Entering 2013 I thought that I had a pretty firm grasp on what I wanted to accomplish. Specific races, distances and my assault on PR’s. Above all else, I wanted to finally take that 800 lb. monkey off of my back and run that 2:59:00 marathon. But a funny thing happened to me along the way. As I recovered from injury at the start of the year I climbed back on the horse and circled a Fall Marathon for my sub 3:00 hour effort only to re-aggravate those pesky strained ligaments in my left ankle and I was once again on the shelf, facing more than 6 weeks away from running and training. 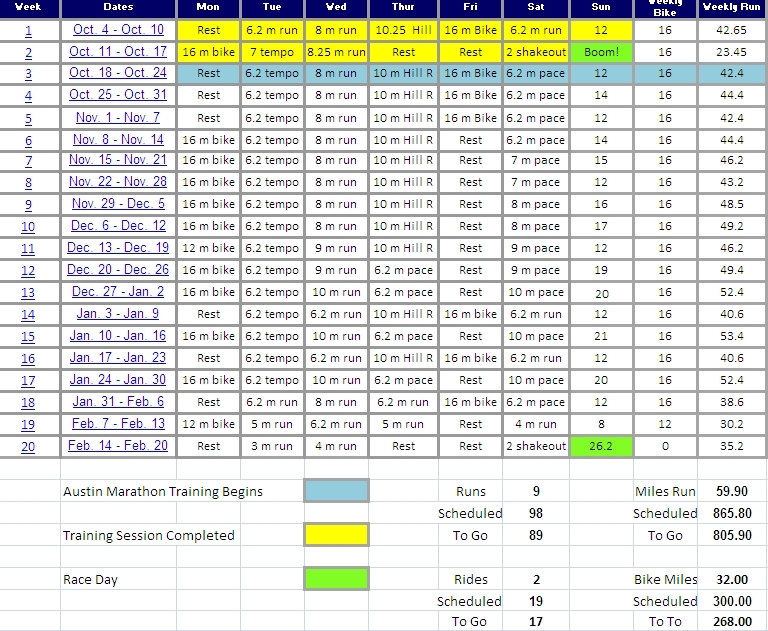 I was able to piece together a solid two months of training and ran a strong 5-mile PR in Cedar Park at the start of November, salvaging what had been a very frustrating year. I spent the last month of the year thinking long and hard about what I want to accomplish from here on out as a 46 year-old dad, husband and part-time endurance athlete. What I’ve come to realize is that there is really only one more medal that I want to earn and that is at Ironman Texas. At that point we will have run more than 10 marathons, competed in more than 100 run-only events, hung more than a dozen half-marathon medals on our rack and filled a couple of shelves with age group awards while compiling a pretty impressive running resume of Personal Records and best ever times. Sub 3 hour marathon? Who really gives a sh#%? Not my wife, not my daughter, certainly Dom would care less about something like that as he certainly had a handle on what was truly important when he said goodbye to all of us. So in 2014 I’m going to keep it really simple. Train smart, stay healthy. It all starts here. Pace my friend Bob at the Austin Half-Marathon to a 1:28:59 and his guaranteed entry into NYC Marathon 2014. Ironman 70.3 New Orleans in April. Dress Rehearsal for IM Texas. Dial everything in. Ironman Texas. Never give up. Never quit. Always try. Get that finisher’s medal. Spend the rest of 2014 running when I want, swimming when I can, biking when it’s fun. Spend time with my family, raise my daughter and collect smiles. Hop in a race from time to time when it feels right and I miss it. Run in the rain because I want to, not because I have to. I started the new year with an “easy 10” – wrapping things up in a little under 1 hr. 14 minutes (7:24 pace). From here to Ironman there will be very few if any rest days or complete days off. That’s fine, one more push and we’ll have crossed off one heck of a list since we started all this running for Dom back in 2009. Make no mistake, don’t think I’m about to lay down out there. If you are hoping to beat me on race day, you better bring it – because I’m certainly going to. I just don’t know any other way to do it.